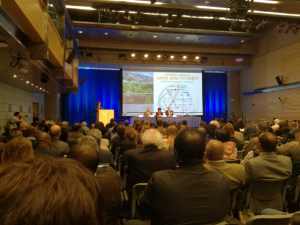 The 18th annual world bank conference on land and poverty was held on 20-24 March 2017 at the world Head Quarter in Washington DC. 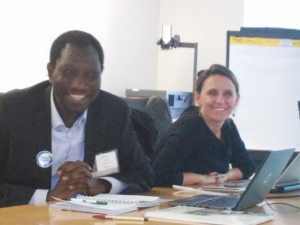 This one and a half-day learning exchange engaged GLTN members, Solid Ground campaign partners and Habitat for Humanity, who support land-based efforts across the globe. GLTN and Habitat for Humanity co-organized the learning exchange, with campaign partners and GLTN members. 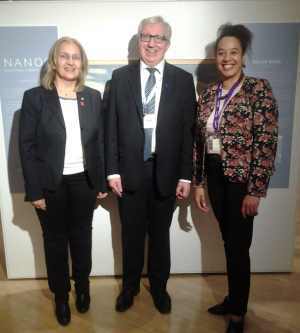 The week began with a pre-conference reception at the Embassy of Finland in Washington, March 20. Finland is celebrating its centennial as an independent country in 2017, and has walked the way from poverty to an efficient and reliable state. Finland offers a practical approach to building sustainable, smart solutions to cover issues from land management to urban development and climate change. Innovative, state-of-the-art and easy-to-use solutions provided by Finnish companies deliver solutions to data collection, documentation, and distribution. As our 2017 FIG working week hosts, it was our pleasure to share their celebration and meet with experts from the Ministry for Foreign Affairs, the National Land Survey of Finland, the National Trade Promotion Agency Finpro, the National Innovation Funding Agency Tekes, and private companies specialized in modern spatial data infrastructure. 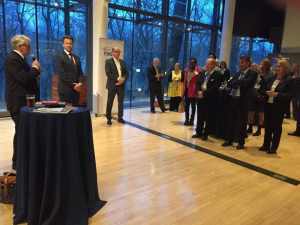 Reception at the Embassy of Finland in Washington due to the celebration of its centennial as an independent country in 2017. Finland is also host of the FIG Working Week 2017. 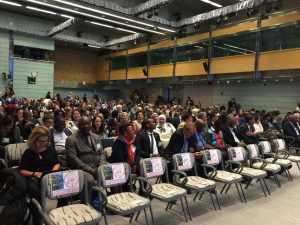 The WB Land Conference hosted more than 1,250 participants from over 130 countries, as it continues to help shape the land agenda and facilitates the building of connections during a wide range of meetings, roundtables and deliberations relating to the conference theme. Participants included FIG President C. Potsiou and Vice President D. Dumashie, Honorary FIG Presidents S. Enemark and R. Foster, FIG commission 8 and commission 9 chairs K. Tenadu and S. Nystrom, FIG former Vice President D. Alnaggar, FIG honorary member C. Lemmen, FIG WW 2017 organizing committee from Finland, several FIG experts including the former FIG Com9 chair K. Viittannen, delegates from various countries, especially developing countries, government representatives, academia, NGO's and CSOs, the private sector and world bank development partners. The conference theme, underpinned by recognizing responsible land governance, arises because of the fact that large parts of some country populations may lack clear rights, documents may be out of date, and the persistent failure to manage land to maximize social and economic benefits. Accordingly, the discussions and presentations considered how to close the gap between reality and legal provisions of land rights and management for urban and rural development. improvements in the ability to process data. 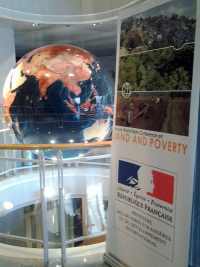 FIG is a key partner of the GLT Network, who were very much visible during the week. 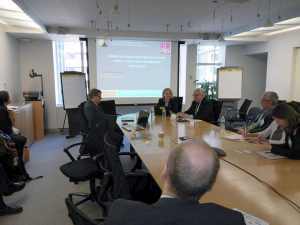 President Potsiou participated to the IAB Meeting, held on 20 March, on the strategic discussion about the future of GLTN. The board agreed to aim at having a draft Strategy by September 2017. The importance of improving the GLTN governance structure in a way that will suit the need of the Phase 3 strategy under development and to allow for inter-cluster interaction was emphasized. The President also participated to the Cluster leaders meeting on 24 March, where an update on the implementation of the clusters’ Work Plans was discussed; cluster updates will be uploaded at the GLTN website. 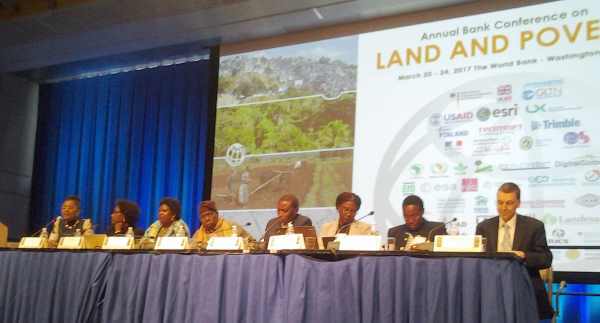 Vic President Dumashie participated to the session on, 'Capacity Building for Scaling Land Administration'; 'Vision for achieving global land tenure security', this session was particularly interesting given the VP Dumashie’s previous involvement in the 2016 UN Habitat EGM held in new York, on 'Land in the New Urban Agenda'; and finally, 'Land value capture experiences' again this topic deliberated on matters that FIG (both President Potsiou and Vice President Dumashie) have inputted at the GLTN EGM held in Sounio, Greece, September 2016. President Potsiou also chaired the session on “Capacity Building for Scaling Land Administration”, on 21 March, with very interesting presentations from International Association of Assessing Officers USA, LX Korea Land and Geospatial Informatix Corporation, GLTN and universities of Florida, RMIT of Australia, Ardhi, East London and Twente, and university of Munich. She then participated to interesting sessions on establishing NSDI and on quantifying the benefits of it, and on vision for achieving global land security. 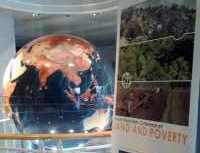 Networking receptions of GLTN partners and on “Towards a New Property Rights Conversation: PRINDEX closed the day. The Global Property Rights Index (PRIndex) is a new initiative that uses opinion surveys to measure and understand perceptions of tenure security, by country, across the globe. During the meeting the results from PRIndex's first nine countries were shared at this gallery event. On 22 March, interesting morning sessions included “Standards for Land Administration: Ensuring Interoperability”, “Putting Fit for Purpose Land Administration in Practice”. On 23 March, President Potsiou gave a presentation on her research on formalizing real estate markets in European region (with a special focus on Greece, Kosovo and Romania) at the session “Governance of Real Estate”. 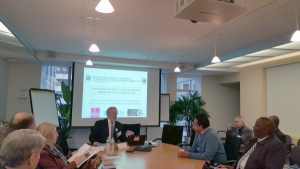 This research is accomplished within the framework of the FIG Task Force on Real Estate Markets; the “Innovation Fair: Interoperability & Land Use Applications” session on March 23 included numerous interesting papers including a viable approach for decentralized mapping systems with integrated data validation, data exchange form decentral organization to a central agency by SLM Land Management Foundation, FIG, SGS Inc, and the Federal Office of Topography, swisstopo. On 24 March she participated to the FIG/GLTN/WB Session on “Fit-for-Purpose Approach to Land Administration in Africa” expressed her acknowledgments to the authors on behalf of FIG, she also emphasized the importance of land administration and the need to adopt methods and technologies that will facilitate a fast, affordable and reliable nation-wide establishment and maintenance of a system that will help poverty reduction and development. The President then participated to the session on presenting the “Guide to the Valuation of Unregistered Land” and shared ideas with the authors and contributing experts for this important initiative. The Guide is at its final stage of development and is expected to be published soon. The conference concluded with a clear message that building on the demonstrable capacity of the world bank in analytics, together with its partners in all regions can evidence and ultimately implement solutions, noteworthy is the ultimate partner, the politicians. This was clearly highlighted in the Africa Region, Klaus Deniger of the world bank was honored to welcome the former President of Nigeria who launched a newly established African Land Advisory Group (TAfLAG), a distinguished group of African land professionals who can influence at the political level, guide and add their collective experience to help solve African continental issues on behalf of governments and civic society.